I'm a girl who loves a good to-do list, but lately, that obsession has teetered into an unhealthy relationship. I find I can't relax until my lists are completely crossed off, and let's face it: when has that ever happened? So this weekend, I made a point of embracing the undone. I made lists of everything that needs to get done in the month of June: household projects to complete before my in-laws visit in July; rooms that need to be cleaned; errands that need to be run; calls that need to be made. From those lists, I pulled out the items with hard and fast deadlines: two reviews due today. Then I put the rest of the lists in a drawer and sat down on the couch to watch Outlander. It was uncomfortable at first; I actually went upstairs to get a basket of unfolded laundry to fold while watching the show. But after the laundry was folded, I just sat. And watched. And sat. And watched. And sat. And the longer I sat, the more comfortable I became with just being there, doing nothing but watching my show. And the house didn't fall down. I even slept better than I have in weeks. I tried it again today: those lists are still tucked inside a drawer, and I won't pull them out again until tomorrow. Sure, I made coffee and went to the farmer's market and wrote my two reviews with hard and fast deadlines, but I also curled up in the sun-soaked reading nook my husband built and read an entire novel cover-to-cover and took a nap. I wrote a letter to a friend. I made myself a sandwich. "Nap", "call a friend," "read a book": these are not to-dos that often end up on my lists. But that doesn't mean they are things that don't need to be done. Only be embracing the undone was I able to realize how much I truly had left to do--only this list doesn't feel daunting. This is something I've come to embrace over the past few years (with good balance) and it's been so needed. I love getting up early on the weekends and knocking out things I need to get done (like groceries and other errands) so that I have the rest of the day to relax without guilt - it feels pretty great! I tend to get up early, but find that my first few hours of any day-weekday or weekend--get lost in... I don't even know what. I've been thinking a more solid routine of getting things done in the morning would make my days and evenings feel more like my own, if I can make it a habit. Still working on that. The house didn't fall down?! Lol. I really like this post. So true. I love a To-Do list but it is a constant work in progress. Plus I'm always switching around when the best times to do everything is. Errands in the morning or after I write? Reading first or writing first? What works one week doesn't always work the next. Except the napping. The napping always works. You and I are so in sync right now (tempted to say N*SYNC) with all of this. I had a huge "ah ha" moment last week when I realized I was unemployed and yet STILL stressing myself out with "to-dos" and not taking time to be present and do the things I'd like to do. I was creating huge lists for myself with a result of spending way too much time home on my couch "working" and no time outside unless it was running errands. (I wasn't even reading nearly as much as I'd like to be.) 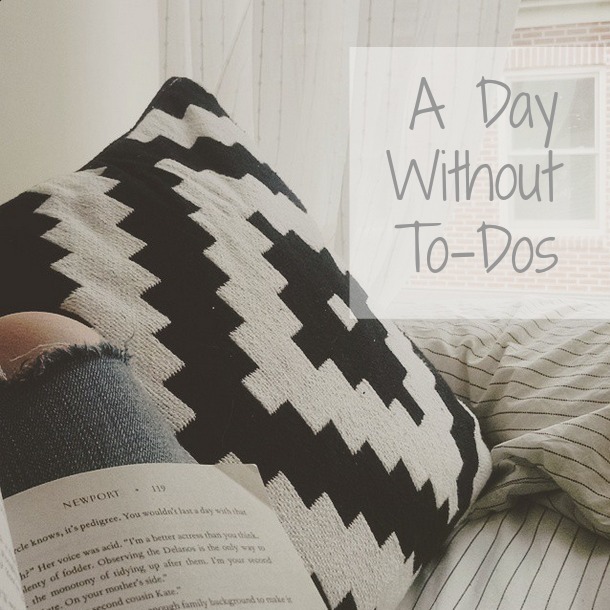 I'm cutting down on my blog posts and non-essential "to-dos" this week and aiming to embrace my free time and let myself do whatever I feel like doing. (For the record, I laughed out loud at N*SYNC, but also for the record, I haven't yet finished my first cup of coffee). I'm so glad I'm not alone in this--and your posts on meditation have me wanting to really buckle down and focus on trying that in the near future (maybe I should write it on my to-do lists!). I love this so much! I'm glad you're finding a way to balance the need to do with the want to do. It's so easy to go crazy if you don't (I definitely break down every once in a while if I don't take a break for myself). It sounds like you still get a lot done every day, so obviously there's no reason to feel guilty!